Short version: I ran my second 100-miler and did it almost 4.5 hours faster than my first one, and the experience made me question where my true potential lies. A week after Rocky Raccoon 100, which was my first 100, I was trying to get info on another ultra that was underway; I was interested in it because the winner of Rocky Raccoon, Mike Morton, who’s an amazing runner (major understatement), was racing another 100. Mike and I had crossed paths a couple times, the most notable one being when he agreed to wear an orange bracelet in honor of my friend Jenny who is going through some serious medical issues; there’s actually a small photo of Mike on the cover of the March Ultrarunning magazine that was taken during Rocky Raccoon, and the bracelet is visible—pretty neat. After trying a few other avenues with no luck, I went to Mike’s Facebook page to see if there was any race info on there, which there was. A guy who was in contact with people at the race was posting a couple updates, one of which had a few responses to it. The first thing I thought when I looked at the few other responses was, “Whoa! Eric Clifton is posting here!” It shouldn’t be a huge surprise since Eric was Mike’s crew chief at Badwater last year when he won it, but I’d only ever heard of Eric, never met him or interacted with him at all. To me, he was a name far removed from my reality. I posted something in the thread, to which Eric responded. Then we exchanged a few messages back and forth, which was neat but very weird to me honestly. I mentioned my first 100-miler and my upcoming one, and he said he’d heard of the upcoming one. He also noted that he lived pretty close to there and could stay with him if I needed a place to stay. Whoa! We eventually brought the conversation to private message since we’d been using Mike’s wall as a chat session. When I told Eric about my next 100-miler, I admitted I didn’t know how to approach it. I also mentioned that BLU was never meant to be a goal race; I’d signed up for it months prior and hadn’t *really* committed to doing it until after Rocky Raccoon. He gave me a new perspective on running which totally changed how I treated the time between Rock Raccoon and this one. Instead of primarily resting like I’d planned, I got my weekly mileage up to a peak of 70, including a couple runs around 20 miles, and one instance where I ran 15 miles one night followed by 18 more the following morning. One thing Eric told me in one our first interactions was: “Great accomplishments are not achieved from mediocre efforts.” This really stuck with me. I had already met my goal of “just finishing” a 100-miler at Rocky Raccoon; it took 29 hours and 17 minutes, but I had done it. I decided I wanted more. I wanted to see what I was really capable of doing, or at least get closer to it. In the last month or so, I’ve started to question my limits, particularly with regard to running. Nearly every goal I have ever had in running has been arbitrary. I’ve met a lot of my goals, but instead of viewing those as successes, I instead wondered how much greater my potential actually was. Maybe my goals had been too easy. A few weeks before the race, my friend Roz came to my mind and I couldn’t stop thinking about her. Lt Roslyn (Roz) Schulte was a classmate of mine at the Air Force Academy. Tragically, in May of 2009, the vehicle she was riding in while deployed to Afghanistan hit an IED and she was killed. She was my first friend (albeit not the last) to be killed in action. 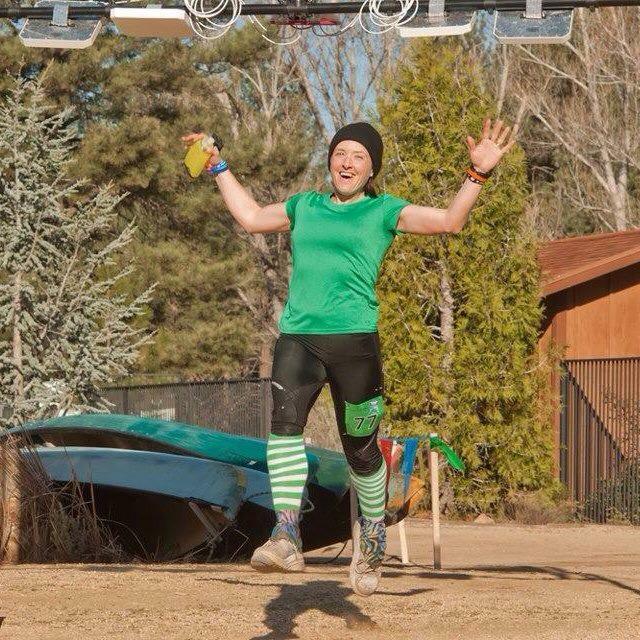 There was a group that formed shortly after her death, Running for Roz, that raised money in her name. Several months ago, I had inquired about how I could get a Running for Roz shirt to do one of my races in, and I received one almost immediately. 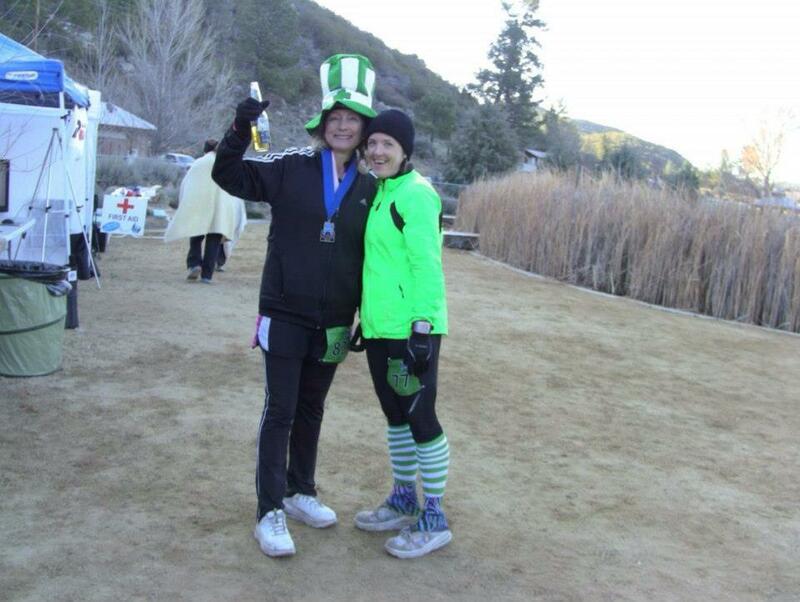 I had not worn it in a race yet, and I realized it would be perfect to do the BLU 100-miler in Roz’s honor and memory. I realized I could also use this as an opportunity to raise some money for her two memorial funds. At one point, I was concerned that running the race for Roz was in conflict with my aggressive approach to the race, but I quickly realized it was actually very appropriate. One very easy lesson to be learned from Roz’s short life was that life should be lived to the fullest. I intended to run the race to the best of my ability, to run it passionately, and to truly embrace what life had to offer. I also learned that the day after the race was Roz’s 29th birthday. Interesting coincidence. Going into the race, I was really excited, not just about doing the race but about all of the friends I would get to see again. I knew at least 15 of the people who would be there, and since it was a small (1.78-mile) looped course, I knew I would get to see everyone many times. This was the inaugural BLU race, although the race directors hope to expand it to many similar races across the country. One of the neat elements of the race was that lodging for the 100-mile, 24-hour, and 50-mile runners was included in the entry fee (there were also 50k and marathon options). 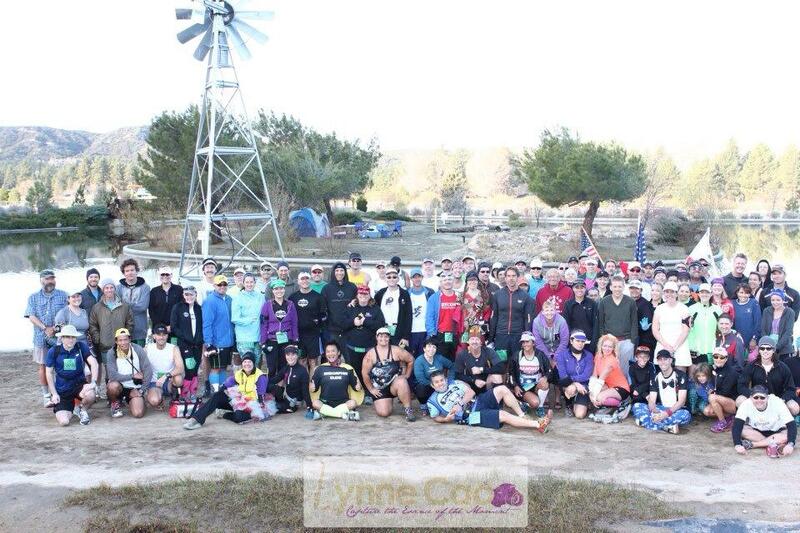 The race site was at a camp that had cabins right along the course; the cabins are where we all stayed. It was bunk-style sleeping arrangements, but there were restrooms with running water! 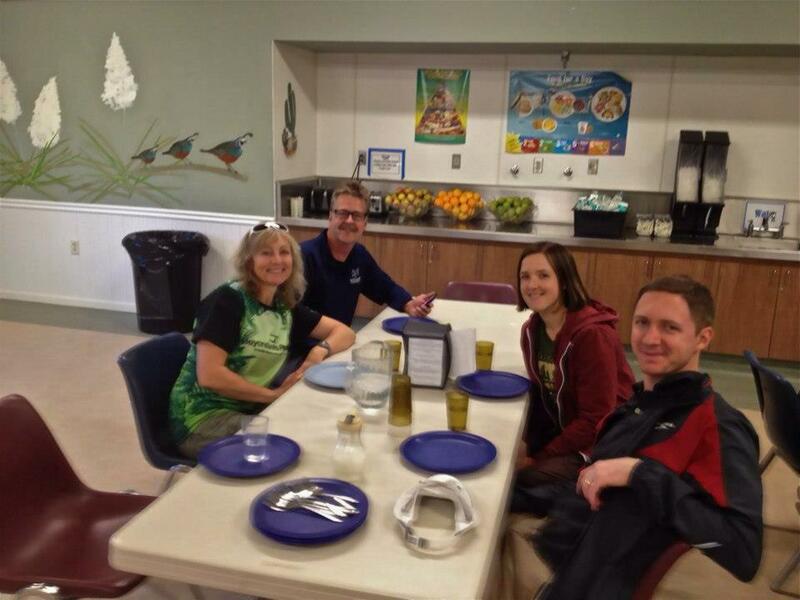 Also, dinner the night before and breakfast the morning of the race were included in the entry fee, and the cafeteria was within a 5-minute walk of the cabins. 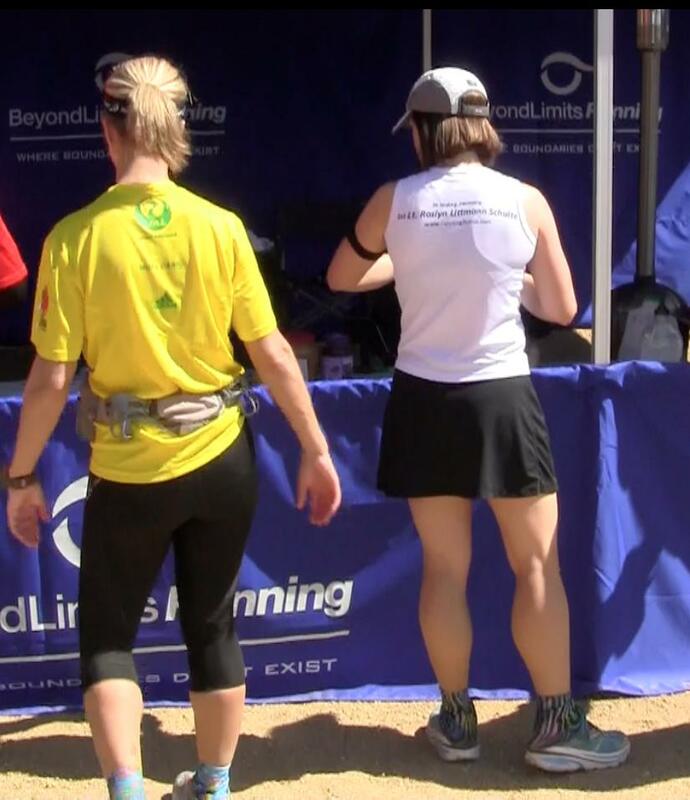 Everything was located very close together which cut down on some of typical race-day stressors since there were very few logistics runners had to concern themselves with. My husband Asa and I arrived at the ranch around 4pm on Friday. The first person we saw was my friend Joel. 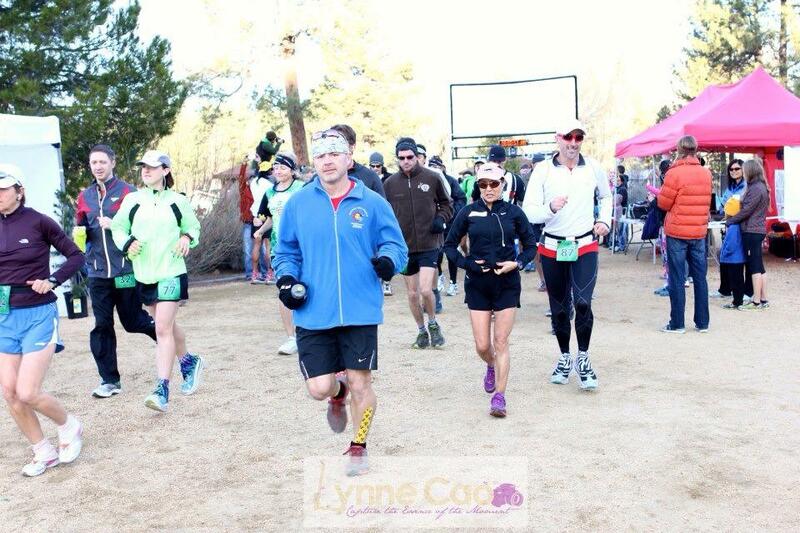 When my friend Karla ran Badwater last year, Joel and I were her pacers. Not too much more time passed before Karla and her husband Z arrived; all of us were staying in the same cabin along with some other people. We walked to pick up our packets and met some more friends along the way. I met a guy named Mike who I’d crossed paths with a few times before but never actually met in person; he and his wife Kimberly had worn orange bracelets for Jenny, and actually, earlier this month, they went down to Mexico for the Caballo Blanco Ultra in the Copper Canyon (which should sound familiar to anyone’s who’s read Born to Run). They actually gifted one of their bracelets to a Raramuri (Tarahumara) runner—this story was actually the first thing Mike said to me. Very neat I met one of the race directors, Ken, for the first time in person (although we’d exchanged messages online) and also met his girlfriend Stephanie (who I’d met previously) who was the other race director. They both seemed surprisingly calm, especially considering this was their first race-directing experience. At dinner, I saw more friends, including meeting a few I’d only previously known online. I also got to “officially” meet a guy named Claude. We had crossed paths multiple times over the last few years; we saw each other last month at my first 100-miler, I remembered seeing him at Badwater last year, and I finally recently figured out where I first saw him when I came across an old photo. In late 2010, right before I deployed, I did a small 8-hour race. Somehow, I managed to be the winning female; Claude had been the winning male—I hadn’t remembered this until I saw the old photo of the final standings written on a dry erase board. The ultra community is super tiny. I also got to meet a lady named Shawna. I felt like I already knew her family based on stuff I’d read online. I was particularly impressed by her 12-year-old son Colby who had done his first marathon just a few months ago, and a week before BLU, he did his first ultra: a 100k! There was a speaker at dinner: Jordan Romero, who was the youngest person to climb the highest peak on each continent… and he’s only 17. Wow. He and his mom were doing their first marathon at the race. That’s something else unique to point out about this race: Not only did the 100-miler have a liberal 32-hour cutoff, but all of the other races, including the marathon, had the same cutoff. 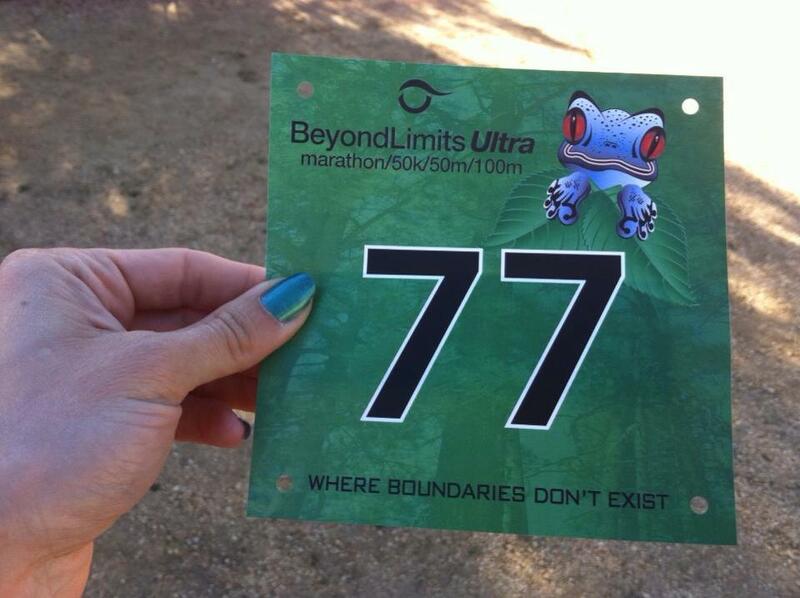 For this reason, there were a lot of first-time marathoners and ultrarunners, which was really neat. The course was a flat mostly dirt loop that had two out-and-back sections; it was as unintimidating as possible. The only real challenge was mental. 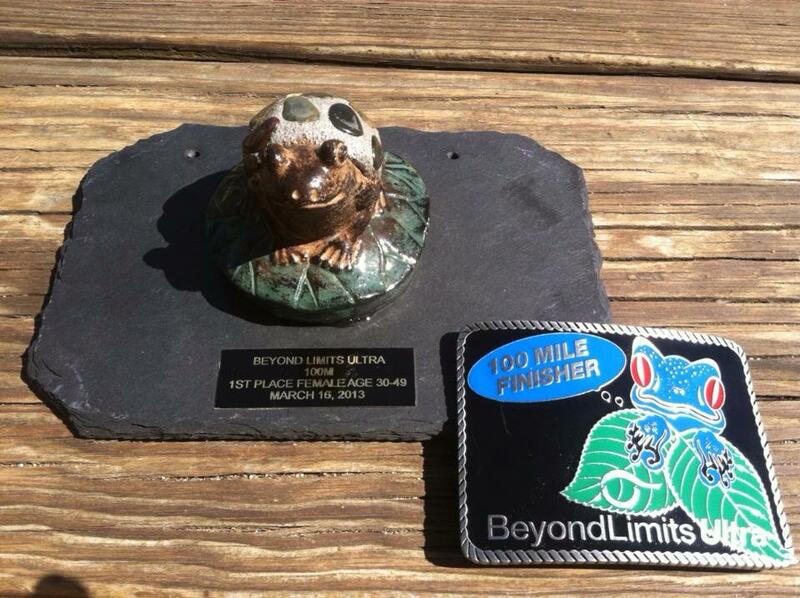 The 100-miler was 56 loops. The course was set at an elevation of 4,600 feet, which isn’t super high, but not totally unnoticeable. The race day temperature was projected to be between 45 and 65 degrees F, which is perfect running weather in my opinion. I slept surprisingly well before the race, and luckily there weren’t any “crazies” in our cabin who felt the need to wake up at 3am for an 8am start, haha. Most people went to the cafeteria for breakfast, but before every race that is a marathon or longer, I always just eat a banana, so I stayed in the cabin and took more time stretching and getting my drop bag ready (which I put just outside of the cabin since the course went right by it) while eating my banana that I’d brought with me. When I got to the start line, they were already making announcements. I had wanted to go meet Eric Clifton, who was actually doing the race (gasp), beforehand, but I couldn’t find the right time to do it between announcements, so I didn’t. I had decided my strategy for the race was to run by feel and not to set numeric goals or try to run certain splits. I was apprehensive about this, but really excited to try something new. The race started and Asa and I ran together for a bit; he was doing his first 50-miler (even though he hadn’t trained for it!). I was wearing a Garmin so I knew my pace, but I only looked at it out of curiosity; I chose to not make any decisions (like speeding up or slowing down) based on what it said. I was running with my 12-ounce handheld water bottle because I didn’t want to have to stop and get water as often. I had elected to take a gel every other lap for a while. The first few laps were uneventful, but people were already starting to spread out, especially with everyone from all of the races on the same course. It was only about three laps before I started getting lapped and lapping others. With the out-and-back sections, there was tons of interaction with the other runners. As with every single other ultra I’ve done, everyone was super encouraging. My friend Ed, who is known for dressing in jester attire, was out there doing what turned out to be 160 miles over the weekend, and he gave high-fives on virtually every exchange. Ed is also in pursuit of trying to break the world record this year for the number of 100-milers run in a year. Eric and I never officially introduced ourselves to each other, but we started exchanging waves too and a few words every now and then. I learned a lot of lessons from my first 100-miler, including the need to stay very aware of what’s going on with my body and to be proactive. 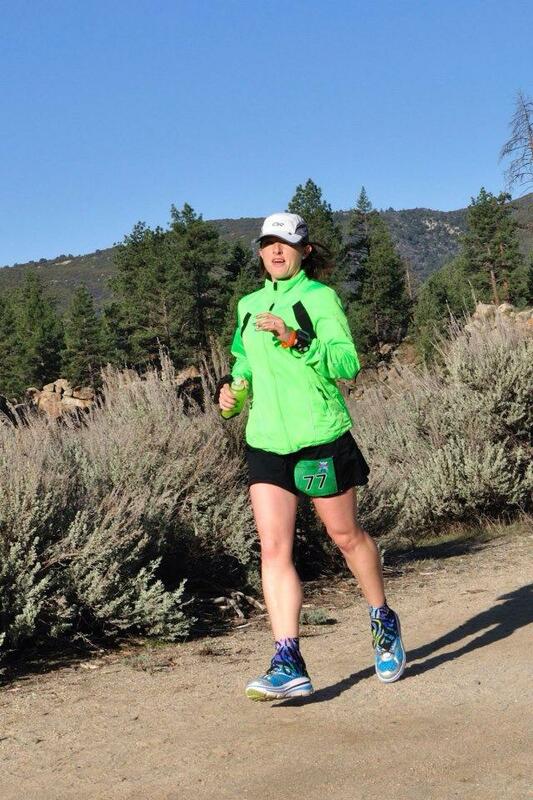 At Rocky Raccoon, I had developed blisters before the halfway point, even though I never noticed hotspots developing, and I never dealt with the blisters because I didn’t know what to do. This resulted in walking much of the race between miles 45 and 80 and nearly all of miles 80 to 100, with the sensation of walking on broken glass with every step for over 8 hours. I did not want to experience this again. Near 20 miles into the race, I noticed a hotspot forming on my right big toe. The temperatures were rising and due to sweating a lot, I also noticed some chafing under my bra strap in back. Luckily Asa was in the cabin when I went in and helped me put bandaids on my back, then I changed my bra. I also put a cushioned blister bandaid over the hotspot and changed my shoes. Since it was getting warmer, I decided to run shirt-less (which I typically never do) also changed from my running skirt to a pair of “denim” (pattern) running shorts; the latter decision was admittedly mostly based on aesthetics since my running skirt creates a muffin top and the shorts have a looser band. This whole thing took probably 10 minutes, but I felt it was worth it. I went back out feeling great, but this was short-lived. Somewhere between miles 20 and 25, I began to feel nauseous, which is very uncharacteristic for me. I couldn’t pinpoint a specific cause, but I figured it had something to do with the fact the temperature had risen to 82 (so much for a high of 65!) and I was very thirsty, so I was drinking a lot. But I was still maintaining a decent running effort. The large amount of liquid in my stomach was not in agreement with trying to run. Not knowing what else to do, I chose to walk a loop to see if that helped. It was really hard to do because I didn’t want to walk yet, let alone for that far, and every part of my body besides my stomach wanted to run. But I also knew that I needed to get the nausea under control. I walked about 90% of the following lap, plus about half of the next one, and I felt a lot better. I did choose to take more walk breaks in the next few hours, not because I needed to but because I felt the heat of the day would force me to slow down if I didn’t choose to do so myself. At the end of every loop, there was a screen that showed our mileage, lap time, and standing. There was also a camera that streamed live video, along with real-time lap updates, to a web site where people not at the race could watch for free. This was very neat. I noticed I slipped in the rankings a bit, but like my Garmin data, I only looked for reference, not to make decisions off of. 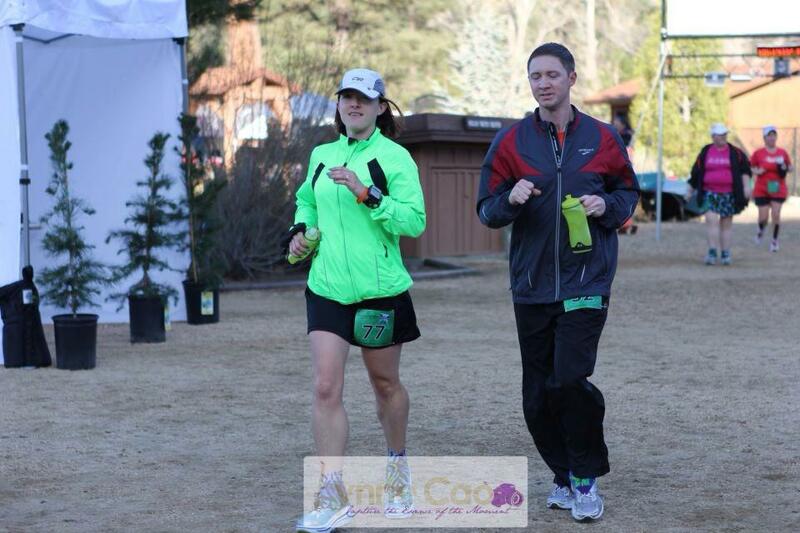 There were a couple more times throughout the race where I had issues with my bra strap chafing; each time, I waited until I caught up to Asa, who was mostly walking, and he’d run with me the remainder of the loop back to the cabin to help me. He’s so awesome. Each stop meant time I wasn’t moving forward, but I didn’t consider it wasted time; instead, I saw it was an investment that wouldn’t pay off until later. The fact I wasn’t focusing on paces made these necessary stops easier to make because I took them in stride and didn’t try to compensate for them by speeding up or worse yet not making them at all. That’s another difference between Rocky Raccoon and BLU. During Rocky Raccoon, I took pride in the fact that besides a few potty breaks, I never sat down or rested for any length of time. I still didn’t rest at all during BLU, but if there were opportunities to sit down or even stretch a bit (like when I was cleaning my foot and letting it dry before putting on a bandaid), I took advantage of it. I spent time with so many people on the course. There was a guy from England named Anthony who I met the night prior to the race who was doing the 50-miler. He was one of the fastest people out there, even faster than most of the 50k runners and marathoners. Late into his race, I could tell that he was not having as good of a race as he expected, but in spite of this, he not only finished but won the 50-miler (even if it was not in the time he’d anticipated). I also spent some time with my friend Tony, who is known by many as Endorphin Dude. I first met him at a 12-hour race I did last summer, with his friend Chris (who was also at BLU). He’s not a fast runner, but he runs a LOT of races. What I love about Tony is his incredibly positive attitude. He’s just a fun person to be around and he smiles a lot. In addition to the family (mom, dad, and son) who I already referenced, there was another family who was also running: I knew Rob from online and he was doing the 100-miler, and his wife and son were each doing their first marathon. They were all so cheerful. I met them all the night before and I was pleasantly surprised to not only exchange encouragement with the son Matthew but to realize he even remembered my name. I had to smile when I finally got to the halfway point and Matthew, who had finished his race several hours earlier was right there and quick to point out in a very excited manner that I was half done (at least by distance…haha). A weird thing happened somewhere between miles 50 and 60: I had a lot of energy and was running when a lot of other people were walking. Previously, in this situation, I would have slowed down in an effort to “save” my energy for later. But in this race, I chose to take advantage of it while I had it because I knew there was no guarantee I could just bank it for later. One of the weirdest things I noticed was that I was “unlapping” some of the faster runners. 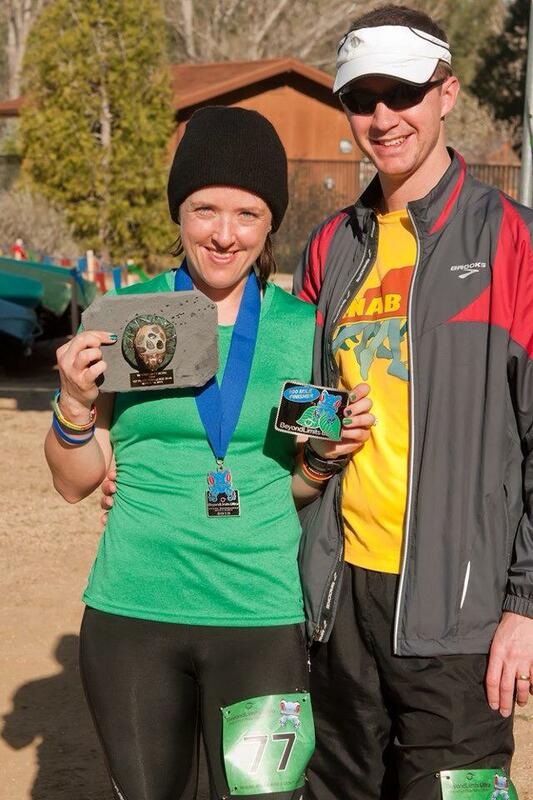 I also spent some time with the eventual female 100-mile winner and some time with the male 24-hour winner. At one point, the people around me were moving too slowly, and when the eventual male 24-hour winner started running, I ran with him… and then at some point, I ran ahead. Logic told me I was in the wrong, but I reminded myself I was running by feel, so I kept moving forward at a pace that felt right. Somehow, in a scenario I could not have imagined, Eric Clifton and I ran together. He was with one of his friends who is a marathoner but totally fascinated by ultras and the people who run them; he was just keeping Eric company. 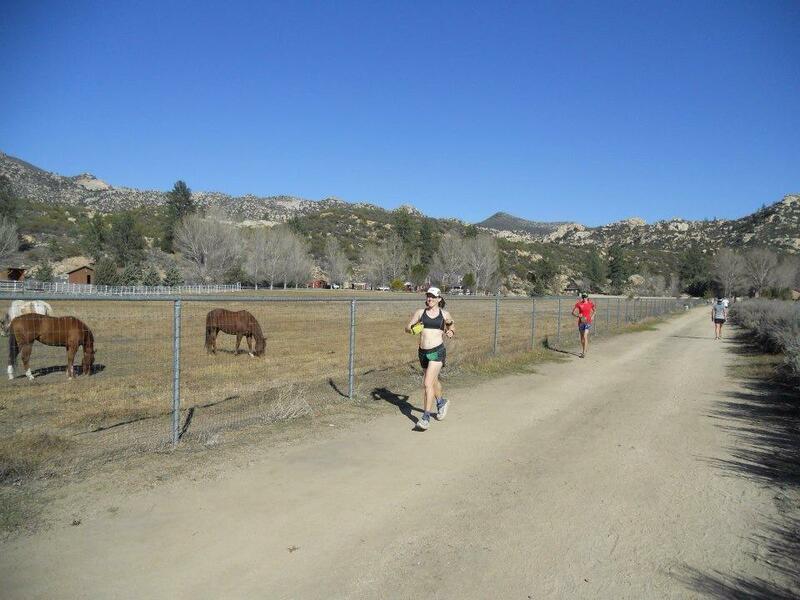 Eric had gone out fast, led the 100-miler for a while, and then crashed and burned. I’d told him through exchanges leading up to the race that he owed me some stories; this spawned from instances like the time I posted a status update on Facebook about Born to Run being an interesting read, to which he responded with something to the effect of, “Yeah, especially if you were at some of those races and know what really happened.” I never expected he’d actually be able to tell me some of those stories, haha. But he did. We actually ran together and chatted for several hours. It was awesome. 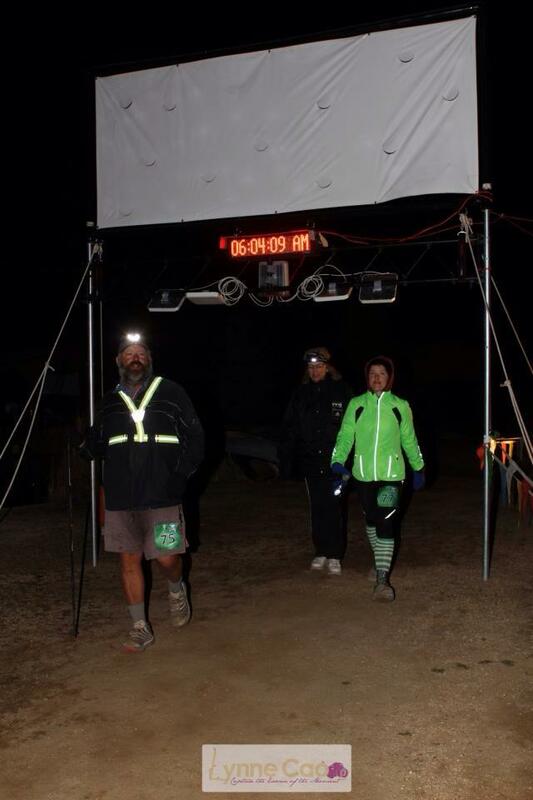 One of the interesting things about Eric is that he ran without a light, even though the course was mostly not lit and there was just a sliver of a moon. But I followed his example and was surprised how well my eyes adapted. It also made the experience more serene. When I run with a light of any kind, I feel sort of like I’m watching The Blair Witch Project, haha, and the motion of the light can actually be disorienting to me. Another perk to running in the dark is that the sky was a lot more beautiful. Living in Las Vegas, I never see stars. But I saw tons of stars above the ranch. Eric tried to find a comet that should have been visible, but that never happened. But I ended up seeing 6 or 7 shooting stars which were beautiful. At some point, Eric’s friend left and Eric decided he wanted to walk a whole loop. I didn’t really want to do this, but my desire to pick his brain more won out over continuing at my own pace, so I walked with him. By the end of that lap, we were both so cold that we went separate ways to put on more layers, and the plan was for us to meet back up on the course somewhere. I’d already put on more clothes earlier—tights, a shirt, and a light jacket, but I was still cold; I’d originally wanted to just wear my shorts since my legs don’t tend to get cold, but at the urging of Eric’s wife, I chose the tights. His wife had actually seen me many loops earlier, before Eric and I had run together, knew who I was, and introduced herself to me. After I put on some more clothes and got out onto the course, I had no idea if Eric was ahead of me or behind me, but I figured we’d find each other. I actually felt really energized, at least in part due to the walking lap giving my body some time to recover. 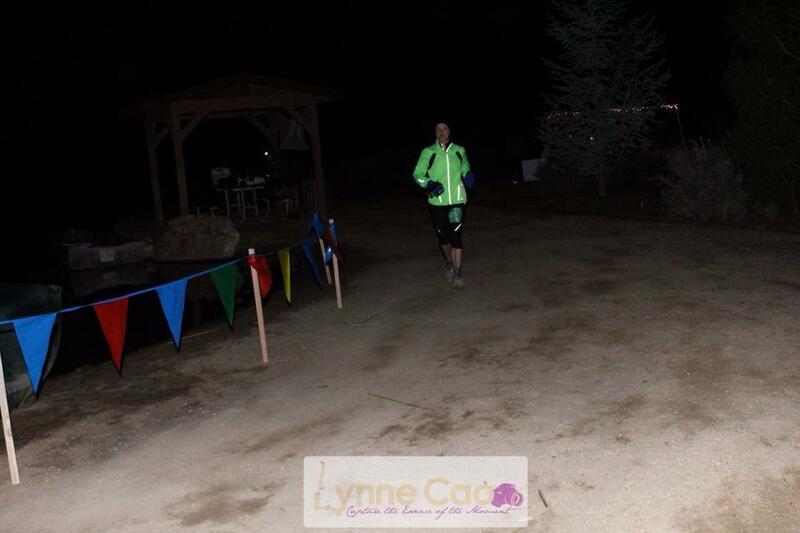 Even though I was around 60 miles into the race, I was actually running, and I was one of the few people running. I felt great. I was also unconsciously motivated to run quicker to try to catch Eric (since I knew we’d never meet up if we were moving at the same pace on different parts of the course). 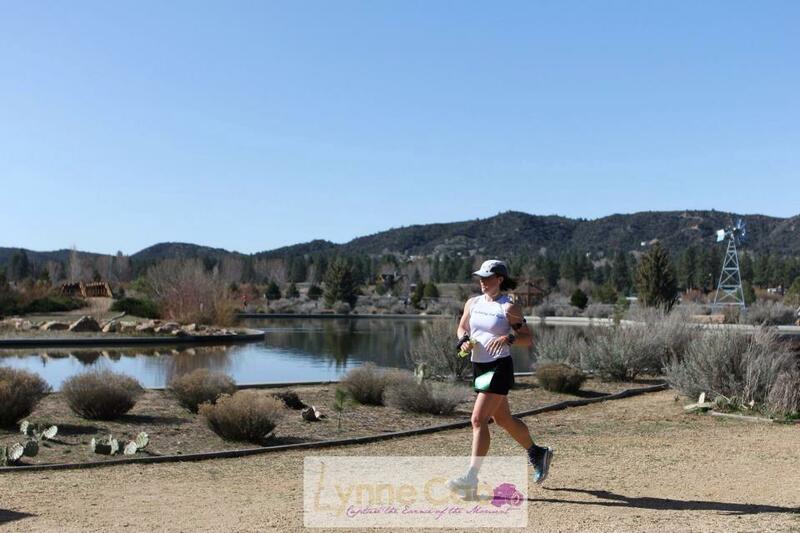 I chatted with lots of people on the course, telling most of them I was trying to catch back up to my running buddy. When Asa and I would cross paths, I asked if he’d seen Eric, to which he always said he hadn’t. After a couple hours, I knew something was weird because I was pretty sure I’d seen everyone on the course. I’d also been checking the standings board which always showed the last several runners to pass through and I never saw his name. Hmm. Eventually, I had a better idea why I hadn’t seen Eric’s name when I looked at the standing board and finally saw his name… and alongside it was his 2+ hour lap. I did catch up to him. As happy as I was to finally see him again, I was disappointed that I knew we wouldn’t be running together anymore… He was moving a lot slower than me. He has issues with the cold and has practically no body fat anyway, so I knew he was in a bad place. I wanted so much to slow down and spend more time with him, but I couldn’t. It was my race in which I was trying to push my limits, which is something that he had encouraged me to do. He had taken a nap, and in that period of time, I’d managed to make up the 7 miles that had previously separated us plus some. I lapped him a couple more times, then he ended up dropping out. I appreciated that he’d waited at the timing area/aid station to let me know and to also give me his contact info since Asa and I would be staying at his home the next night. After Eric left, I was pretty bummed. And more than being bummed, I was COLD. I put on more clothing. This meant I was wearing tights, tech socks, knee-high decorative socks over the top (to cover my partially exposed calves since my tights were 3/4 length), short sleeve shirt, thermal, hooded sweatshirt, light jacket, two pairs of gloves, and a wool cap. I was still incorporating some running in with the walking I was doing, and I was still ridiculously cold. It was definitely colder than 45… actually 30, haha. But it felt even colder than that, which other runners attested to as well. I have experienced tiredness in overnight races before (duh), but I’ve never had a problem with being sleepy… until this race. I found myself nodding off while walking and walking into bushes and fences. I talked to other people on the course who were having the same problem. My only guess is the combination with being tired plus the cold temperatures made the body want to shut down as some kind of defense mechanism. It was so strange. One of my friends actually almost walked into the lake in a nodding off episode. While it struck me as incredibly funny, I knew it wasn’t actually funny. But it did help to walk with other people because just talking kept the mind engaged and everyone stayed awake. I spent quite a bit of time with Karla. I also spent some time with Tony. Ed and his small posse was another group I hung out with in the middle of the night/early morning. The cold really took its toll because there were noticeably fewer people out there in especially the early morning hours. When it was very cold in the middle of the night, my hands were so cold that they were hurting, and I was spending about 5 minutes every or every other lap trying to warm them up with the hand dryers in the cabin restrooms. I didn’t like spending time doing this, but I also didn’t like having cold aching hands. I also made an effort to have the aid station fill my water bottle with hot water each loop as it felt slightly warm through my gloves. I drank sips of it, but I really wasn’t very thirsty. As far as nutrition goes, I continued trying to take a gel every other loop or so, but I was also eating real food. Every loop, I tried to grab a little something (like chips, pieces of tortilla with beans, lentils, potatoes dipped in salt, etc. )—typically just a couple bites of something. I also drank a little cup of some kind of soda every few loops. There was not an exact method to my madness, but I had energy and my stomach wasn’t bothering me, so I figured I was doing okay. 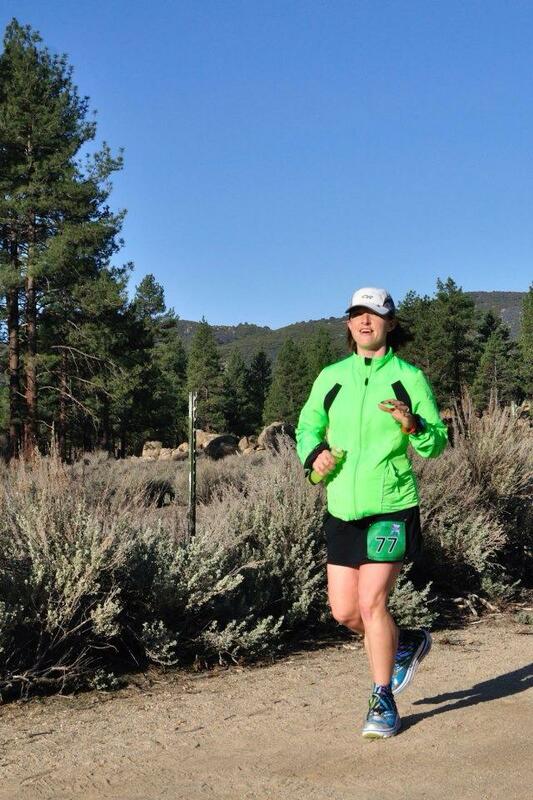 Throughout most of the race, I stayed consistently the 4th female in the 100-miler. Late in the race, Karla was ahead of me by 2 laps and 5th place was behind me by 2 to 3 laps. Again, this was more just reference information for me. My race was dependent on my own effort, not the relative standings of those around me. When the sun came up, everyone seemed more refreshed, and the sun seemed to make everything better. Another neat thing about it being light outside was that runners could actually see one another’s faces in passing. It gets back to the human connection that is so present in ultras in particular. The shared experience means a lot, and being able to actually see other people (not just their lights or silhouettes) is meaningful, at least to me. A few weeks ago, I was picking the brain of my friend Sue. 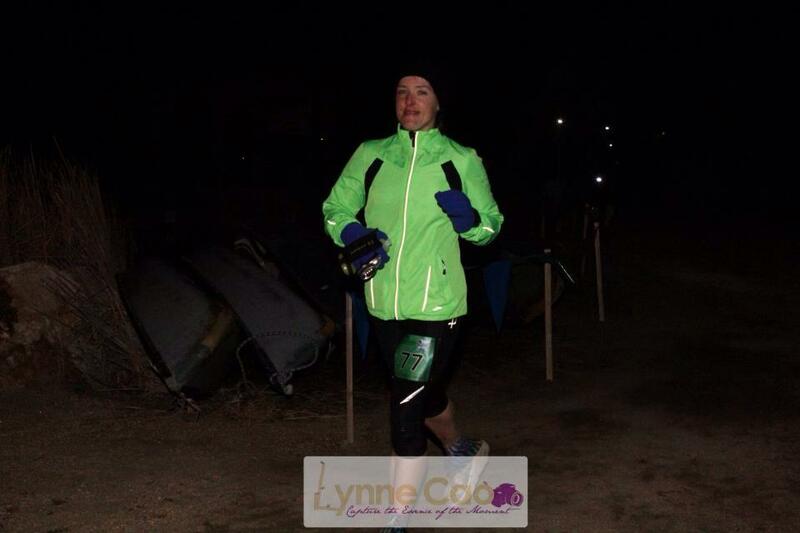 Sue’s an awesome runner; she actually all-out won NorthCoast 24, beating the other females and all of the males. We were chatting about Rocky Raccoon and the upcoming BLU race. One of the things I told her was that my goal in longer races (over 50 miles) is to keep incorporating running into the race as long as possible before the inevitable “death march.” She told me that it was totally possible to still be running late into a race, even a 100-miler. Hmm. Of course this was based on some strategic planning early on, which I had totally not done, but I aimed to still be running bits and pieces at the end. I started running more once the sun was up and it surprisingly felt okay. My right knee had been bothering me for many hours, but after trying to stretch and massage the area around it without much success, I just decided to ignore it. It wasn’t a terrible pain, but it was definitely a discomfort. But I chose not to focus on it. At some point, while Karla and I were doing some running, but mostly walking, together, I realized that if she sped up that she could still make her 24-hour goal. She seemed uncertain of it, but I urged her to just do it. Even that late in the race, I could still do math relatively well and knew our current pace was on the verge of her being able to do it; if she sped up, it was practically guaranteed. So I said farewell to her at around mile 96 (I was around mile 93). Again, what I’ve had drilled into me over and over again is that ultras in particular are about competing against yourself, not other runners; ultras are also about encouraging others. I was happy to see Karla increase her lead on me because she was meeting her goal, and this did not take away from my race at all. Before the race even started, I knew who the female winner was going to be, and I knew Karla would be ahead of me too. 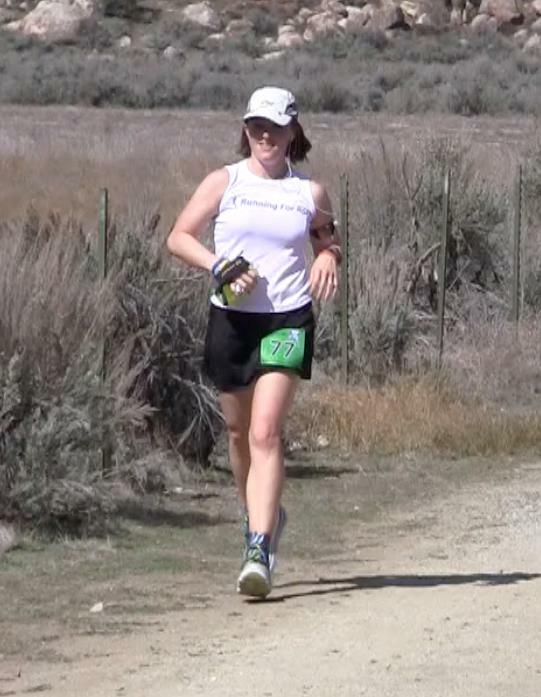 (Of course this brings up my own perceptions of my limitations and how I am “supposed” to perform…) One thing I will note is that females seemed to be more consistent in at least the 100-miler. I don’t think at least the top 6 females ever swapped places throughout the whole race, even though the males between us kept shifting around a lot. When I had 3 loops remaining, I was happy to see my dad at the start/finish/timing/aid area. He’d driven a few hours to see me finish an ultra for the first time. I was a bit concerned because I had no idea what to tell him for a projected finish time because I really didn’t know. He also tends to get places really early, so when I didn’t see him earlier, I wondered if he would be late. I also wasn’t sure if he’d have any idea of where to go specifically, but my cell phone had no reception, so calling him wasn’t an option. I had decided that whatever would happen would happen and there wasn’t a whole lot I could do to change it. I was glad to see he was there with his camera; he takes great photos. When I had 2 laps to go, I saw Karla at the start/finish area and she told me she’d gotten under 24 hours. She was way more surprised than I was. I stopped a moment to take a pic with her and continued on my way. Somewhere around this point is when I looked at any sort of numerical goal for the first time. I realized I had a chance to break 25 hours. I wanted to do this. I spent a little bit of the next, second to last, lap with a guy named Joshua. I’d met him early in the race and we were both happy to have remembered each other’s names. He was wearing a shirt that said “Run It Fast” which served as good motivation whenever I saw it. I was not running the race “objectively” fast, but I was putting a lot of effort into it to run it as fast as I could. Through talking to him, I learned he’d done a handful of 100-milers but that his first one was Rocky Raccoon a few years ago. He was actually closer to the 30-hour cutoff than I had been, but he now has a sub-20-hour 100-mile PR. Again, more motivation. He’d taken a few hours off in the middle of the night with the ridiculous cold, so he was behind me mileage-wise, but he was moving at a good pace. I ran with him for a bit before he moved ahead. My new time goal gave me something to keep me energized. I was running about half of the time with a few miles to go. I was happy to almost be done. With one lap to go, I ditched all of my jackets and long sleeves I’d been wearing so I was just in short sleeves again. It felt cool but really refreshing. I also ditched my iPod that I had worn since the very beginning, even though I only listened to it at all the first couple hours. I ran almost my entire last loop. With less than a mile to go, I caught up to a guy names Chris who was slowly walking along; after a quick exchange, I realized we were both on our last loop, so I told him to run with me. It was really neat to share much of the last mile with someone else. When we were within a half mile of the finish line, I realized we could walk the rest of the way and still get under 25 hours, but I reminded myself that the huge emphasis of this race was to do my best, NOT to focus on numbers (even though the sub-25 hour goal had motivated me for about an hour), so I kept running. Chris had more energy than me at the end, so he ran quicker and finished before me, but that was okay. I was running my race. My last mile was just over a 10-minute mile, which is pretty quick for me under any circumstances. I actually sped up at the very end and leapt in the air when I crossed the finish line in 24 hours, 53 minutes, and 57 seconds. How I had energy to leap I really don’t know, and it wasn’t planned—it just sort of happened. This was a 4 hour and 24 minute PR! I could not have imagined that would happen. One of the first things I did was to go over and congratulate Chris and give him a hug. He was the 1st place male in the 29 and under category. I was the 4th female overall and 1st in the 30-49 (that’s not a typo) age group. 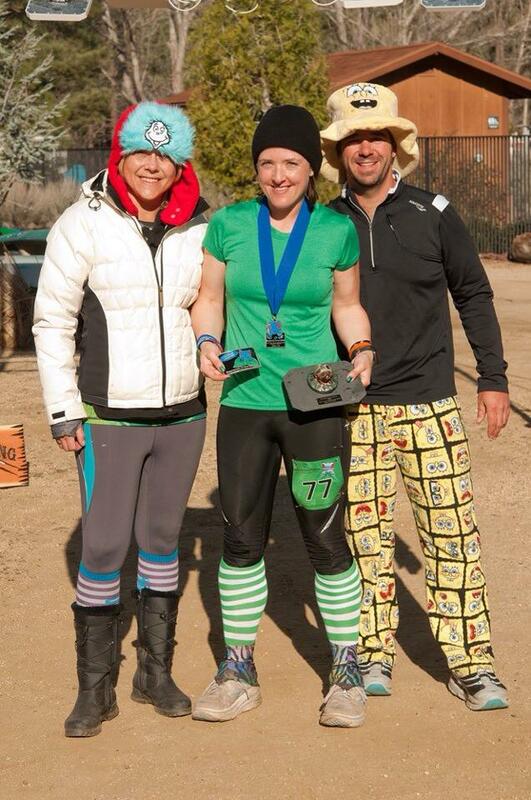 I got my medal, buckle, and award and posed for some photos with the two race directors. Next, it was time for my untimed .25-mile “victory loop” around the lake. Asa had finished his 50-miler about 8 hours before I finished, but he’s waited to do his victory lap so we could do it together. The incentive for doing the victory lap was a bumper sticker (i.e. 100.25, 50.25… 31.35, 26.45), which is a neat little touch. Asa had a lot of blisters, so we just walked the victory lap together. At the end of it, we jumped to get a jumping photo together. While we were standing there, Ed came through and he stopped so we could take a pic together with our orange bracelets for Jenny. Ed had posted something for Jenny prior to the race and said he and I would get a pics with our bracelets and buckles after the race. 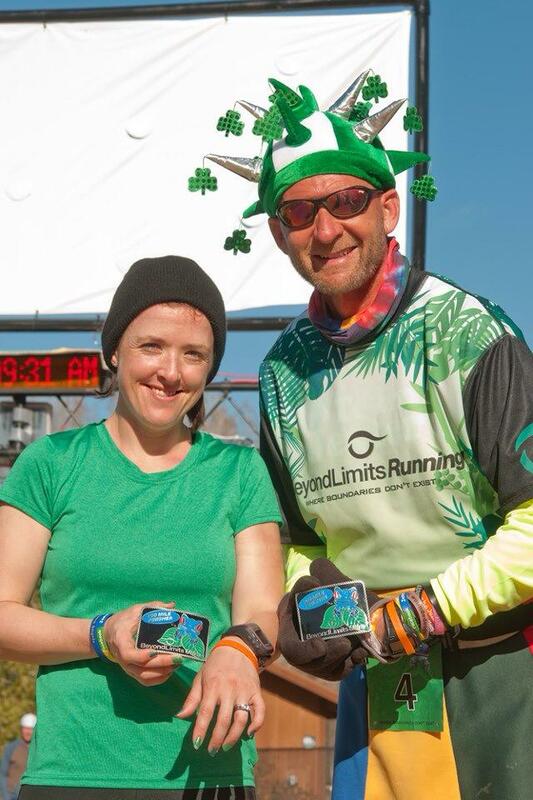 I told him we could just pose with my buckle, but he was insistent that he get his buckle (which he’d already earned after his first 100 miles of the weekend) so the photo would be in line with what he said it would be. Considering his race was still in progress, it meant a lot that he was willing to take a few minutes to find his buckle and take the photo. Soon after finishing, Asa and I walked back to our cabin. I was really sleepy. I chatted with Karla and Z; Karla was trying to rest as well. I fell asleep for a few hours and then woke up, showered, and got dressed in clean clothes. I looked at the time and realized that there were likely still people running, so I stepped outside the cabin and encouraged a couple people I saw who passed by. Instead of leaving right away, I wanted to go to the finish area and see what was going on. There were just less than 2 hours left in the race and there were a few runners still out on the course. People seemed to be moving pretty well. One of the race directors, Ken, noted that he had gone out and spent several laps with my friend Tony when Tony was ready to drop out. 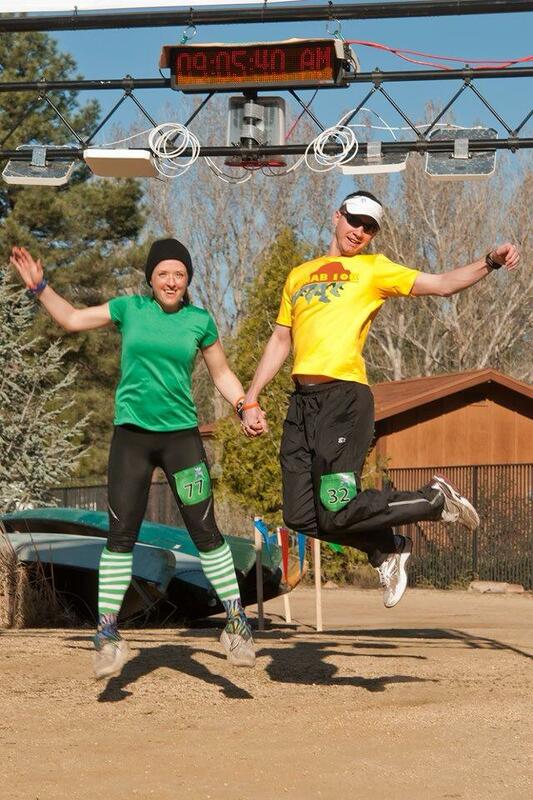 How many other races exist where the race director would do that for another runner? Ken got him back on track, but coming down to his last lap, it was still not a guarantee he would make the cut-off. Ed, who had run 160 miles in the last couple days said he would go out with Tony. I spontaneously volunteered to go back out too. I was sore, and I did not feel great, but I wanted to do my part to help Tony. I grabbed my running shoes and swapped my flip flops for them. Accompanying Tony of his last lap was a great experience. I know he could have done it without me; he was in good hands with Ed. But I wanted to show him some support too. Another lady, whose name I didn’t catch, was also with him. Tony was overwhelmed with people’s willingness to help him. But really, that’s what ultras are all about. I’d had some time to rest and take a short nap; the least I could do was to help someone in some way who had been out way longer than I had ever been before. Tony was insistent that we cross the finish line with him, but as we rounded the last bend, he started jogging and the rest of us stayed back to allow him to experience the full glory of doing 100 miles. He had about 17 minutes to spare. On the advice of Ed, instead of stopping, Tony started his victory lap immediately. And in typical ultra fashion, almost everyone in the finish area chose to do the victory lap with Tony. Moments like that make me so happy. It reminds me that the ultra community is like a family, and the people within it deeply care about one another. It reminds me that there is goodness in the world. Tony received the DFL trophy in addition to his finisher medal and buckle. 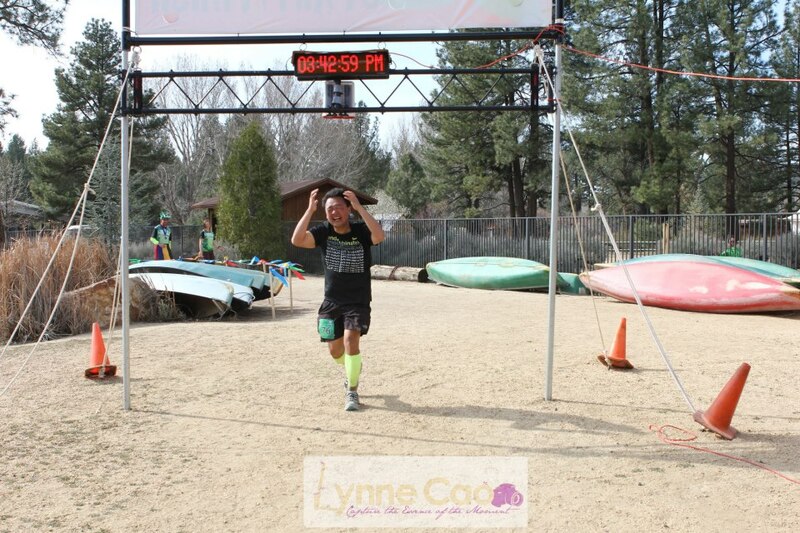 Seeing him finish the 100-miler was heart-warming because he went through so much to get there. Another neat finish was by a lady named Deb. She was not out on the course the whole time, and she walked with walking sticks most, if not all, of the time, but she completed her first marathon. It took her over 27 hours (elapsed time on the clock), the last marathon finisher by nearly 20 hours, but she did it. It served as a testament to what people can do with the right attitude and determination. Seeing her with her finisher medal was so awesome; it was truly earned. I’m sure some people may have read the last paragraph and had some negative condescending thoughts cross their mind. But I have nothing but admiration for people who persevere so much in pursuit of their goals. There seems to be a funny perception that races that have very liberal time limits somehow dilute the experience for faster runners, but this is hardly the case. The faster people, including those who win races, are given their due credit, which is not overshadowed by anyone who is slower. I think it’s awesome that there are events that give people of all abilities the opportunity to test their physical limits. There’s always the argument of walkers and slower runners getting in the way, particularly on a loop course, but this has nothing to do with speed really; it’s a matter of people having mutual respect for the other people out there on a course. There wasn’t a single time during this race where I felt that someone else was in my way. And it was encouraging to me to see people of all abilities out there. After BLU, Asa and I drove to Eric’s house (where his wife lives too, as one might assume). On the way there, I was messaging him back and forth (Asa was driving), and he said he was getting ready to go for a run. For some reason, I wanted more info. Really? I’d just done 100 miles and then done 2 miles with Tony. Obviously I would not run again. Eric noted that my last loop was way fast and that if I could do that, surely I could run again. Huh? It made me wonder, though… Was it possible to run again so soon? My own curiosity and desire to go for a run with Eric and his wife won out over “logic.” We only ran a little over 3 miles, but it was at a pace of about 10.5 minutes/mile. The fact I was able to do that made me wonder what else I could accomplish but was being limited solely by my perceptions of what I thought was possible. I wanted to get a photo with Eric after the 100-miler, but since he didn’t finish it, that opportunity never arose. However, I did decide to get a pic after our run. Eric’s colorful tights are very typical of him. He has tons of crazy tights, all of which he actually made himself. He has more crazy tights than I have crazy socks, and his tights are crazier patterns than my socks too. 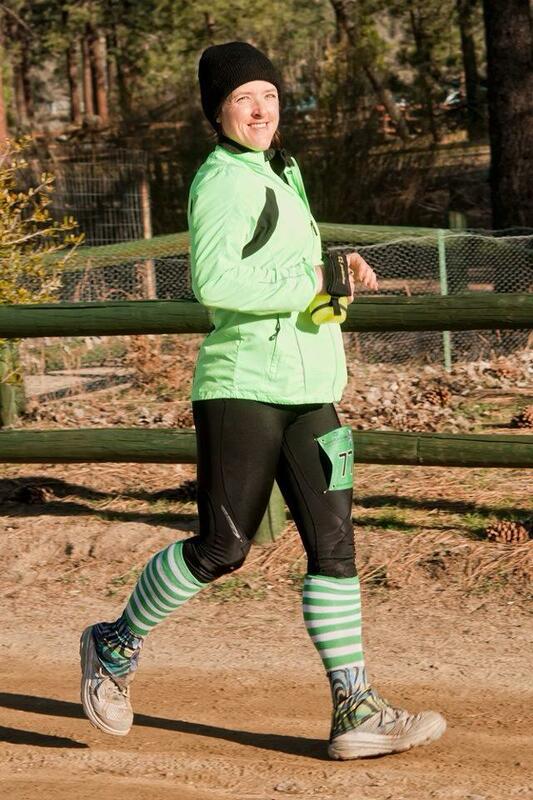 For our run, I felt compelled to put on some St Patrick’s Day socks just to be slightly more colorful; his wife was wearing bright colors too. That night, long after Eric’s wife and Asa went to sleep, I talked to Eric about running and life in general. I figured it was an opportunity that would not come around again anytime soon. It was thought-provoking and made me question my own abilities even more. I can’t relate to him on some levels, but he had some interesting things to say. If nothing else, I walked away from the experience knowing I’d made the best decision to not pay attention to numbers for once, particularly since the numbers I’ve surrounded myself with have mostly been arbitrary. I appreciate Eric taking the time leading up to the race to give me some guidance or at least share his perspective. It was very different from when I actually had a coach, but the nice thing about it was that I could pick and choose what I wanted to do because his advice wasn’t directive. Most of the time I did follow his recommendations, and my race turned out extremely well. It could have just as easily gone the other way, but I really would have been okay with that too. Eric pushes me out of my comfort zone, and I told him early on that I appreciated that he told me things that I not necessarily wanted to hear but that I needed to hear. On a regular basis, I’m surrounded by people who can’t even fathom covering 100 miles on foot, so their expectations for me are nothing. And I don’t have a firm gasp at all on where my potential in running lies, so it’s easy to get complacent. While I get lots of “good jobs” from people just for doing 100 miles, no one really made me consider I could do it better/faster, let alone any sort of training advice for how to do that. But Eric did. However, I’d be remiss if I did not bring Sue up again, because she did impress upon me that I hadn’t yet reached my potential. 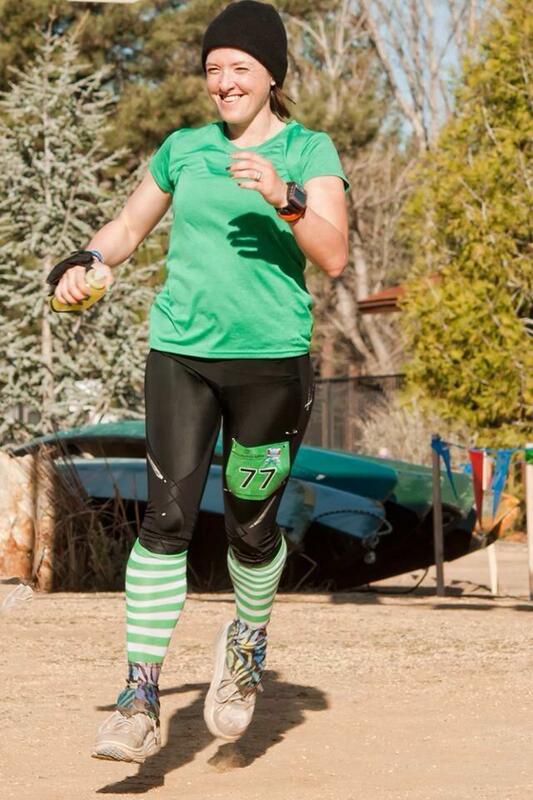 Another person I also need to mention is my friend Shannon who is a very talented runner. I recently read about her 50k national championship road race. The course was on a 5k loop, and I recall her saying how tough the last loop was, and it was the slowest one—but it was still faster than my 5k PR by a bit. I’m in no way saying I could compete at a national level, but I wondered why I was unable to even run a single 5k at least as fast as her worst/final 5k in a 50k. Part of my challenge really has been focusing on arbitrary numbers. I’ve been decent at meeting goals, but unfortunately, because they’ve been arbitrary, they really don’t MEAN much. To test this theory, a few weeks ago I went out to set a mile PR—not to TRY, but to actually DO it. I ran is in 7:08, which was a 20-second PR. Evidence: My limits are largely imposed by me. I have low self-esteem when it comes to running. And while lots of people are quick to say, “You shouldn’t!” those words really haven’t changed anything, regardless of the intention behind them. It’s only been recently, through the insistence of multiple more successful runners who I truly respect and trust, that I’ve started to really change my attitude. In the past, I’ve SAID my attitude changed, but that wasn’t totally true. But I hoped by saying my attitude had changed that it really would have changed, haha. Not so much. But now, I do wonder what else I can do in running. This isn’t just a result of people telling me I can do more but actually running by feel during BLU and seeing first-hand that I’m not as slow as I once was or perceived myself to be (and therefore lived up…or down to). In the past, I’ve been quick to assume, when I hear of other people doing great running feats, that they have an inherent talent. This might be the case. However, attributing others’ success mostly to genetics takes away the hard work they have put in, and it also makes me less accountable for my own performance in comparison. It’s way too easy to assume the people who do really well are genetically gifted and that the rest of us will always be on a subpar level. In one respect, it is true—I don’t think every single person would be capable of running a world record marathon time, for example. But what can each person do? More importantly, what can I do? I’ve interacted with multiple people recently who attribute their success to hard work, not genetics. Hmm. Even if this is just partially true, what is my excuse for not performing better? There are a million “reasons” I can fall back on… not having as much time to train, having competing life obligations, not having appropriate coaching, not having the fanciest running apparel and gadgets, not having access to the same quality of food and supplements, etc. But really, those are excuses. I owe it to myself to find ways to unlock my potential, and most importantly, be mentally okay with the idea of improvement. It’s silly to think that a person would not be okay with progress, but people become comfortable with where they are and it’s easy to assume they’ve reached their potential when they plateau rather than to challenge it and request more. Now for a bunch of photos from the race (in chronological order) followed by a short video that Z put together for me. 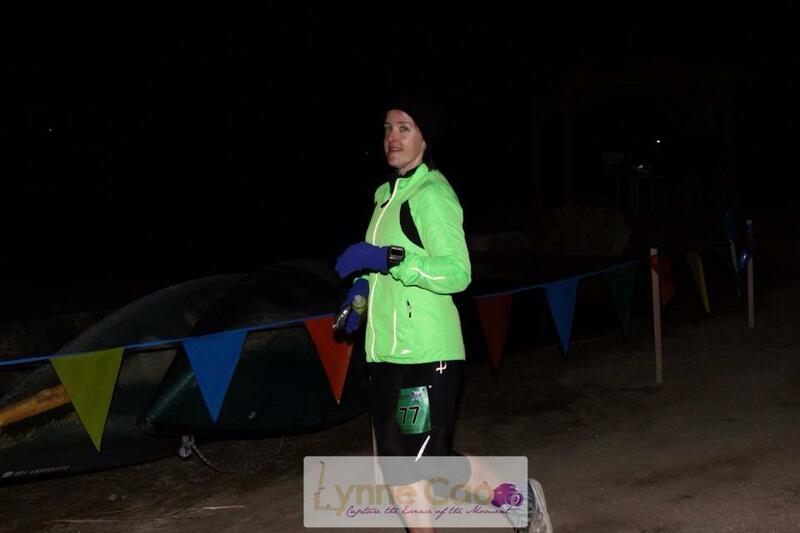 This entry was posted in Race Report and tagged 100-miler, beyond limits, BLU, race report, ultra, ultramarathon, ultrarunning on March 25, 2013 by runningtoabetterme. 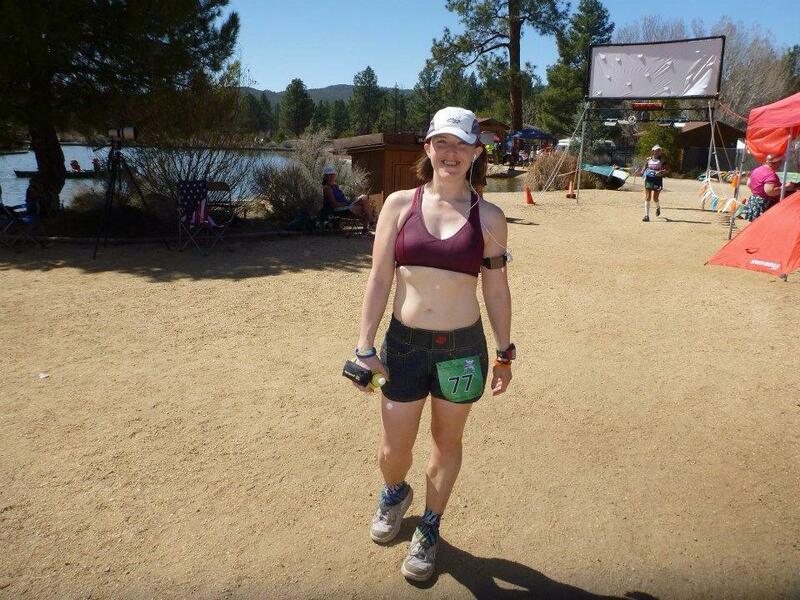 You ran a great race, Katrina, and you’ve become a master-class ultrarunner! This report gives me a lot of food for thought as I approach Umstead 100. Thanks for sharing!